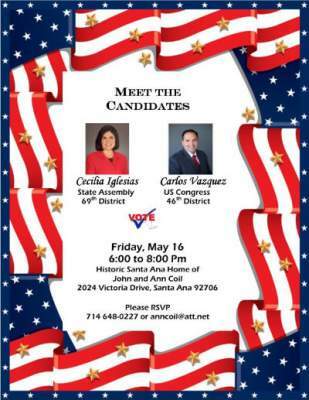 You can meet Cecilia Iglesias, a Republican candidate for the 69th Assembly District, and Carlos Vazquez, a Republican candidate for the 46th Congressional District on Friday, May 16, 2014, from 6 to 8 pm, at the home of John and Anna Coil, located at 2024 Victoria Drive in Santa Ana. RSVP to anncoil@att.net or call 714-648-0227. Why is OCDA Rackauckas shutting Latino candidates out of his next staged rally?